We plan to keep the name as a link to the past, which all forms an important part of the heritage of the House. Within this room is the old bell system which we will also try to retain. 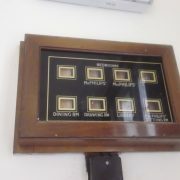 When the House was re-wired in 2016, we discovered some of the ringers still work – this is handy when one of us need to get hold of the other! We have been reflecting on how successful all our Boutique Weddings have been in the past. Leslie and Chris decided to get married here and were accompanied by all their gorgeous family for their wonderful occasion. 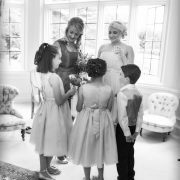 Leslie arrived and added the final touches to her preparations in the Bridal Suite before descending the staircase to music, escorted by her children, to get married to Chris. After the wedding in the Drawing Room, the wedding party had drinks on the terrace and were then announced into the Dining Room for their delicious wedding breakfast. Everyone departed with big smiles in a rocking ‘party bus’ to carry on the festivities at a nearby venue.